The government of South Sudan has agreed to an immediate end to fighting with rebels but warned its forces would defend themselves if attacked. Welcoming the commitment from President Salva Kiir's government, East African states urged rebel leader Riek Machar to do likewise, as fighting continued. But Mr Machar told BBC News conditions for a truce were not yet in place. He did confirm that two of his allies had been freed from custody but called for the other nine to be released too. The release of the 11 politicians, accused of plotting a coup, has been a key rebel condition for any negotiations. It is worth stating the obvious: a cessation of hostilities will only work if both parties agree to it. That means Igad is putting the squeeze on Riek Machar to cease fighting, including reserving the right to take unspecified "further measures" if this does not happen within four days. Igad's communique will be depressing reading for Mr Machar in other ways too. Like Barack Obama last week, the bloc is stressing that South Sudan's elected government must not be overthrown by force. When you add in the rebels' loss of the town of Bor, it has been a bad few days for Mr Machar. It was not immediately possible to get a reaction from the former vice-president. He may be cheered by Igad's suggestion that the South Sudanese government review the status of the detained political leaders. He wants his political allies freed before he agrees to talks. But even here the language was not as strong as in other parts of the communique. Overall, it seems as if the pressure is now firmly on Mr Machar. 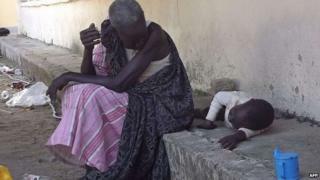 Recent fighting left at least 1,000 people dead, with fierce new battles reported in the town of Malakal, in oil-rich Upper Nile State. More than 121,600 people have fled their homes in the world's newest state, with about 63,000 seeking refuge at UN compounds across the country, according to a statement by the UN. The first UN reinforcements have arrived since the UN Security Council voted to almost double the number of peacekeepers to 12,500. A detachment of 72 Bangladeshi police officers based in Democratic Republic of Congo arrived by plane in Juba. They are trained in crowd management and security, and will be deployed immediately to help with the growing number of people seeking shelter at UN compounds. Mr Kiir is engaged in a deadly power struggle with Mr Machar, his former vice-president. Members of Mr Kiir's Dinka ethnic group and Mr Machar's Nuer community have both been targeted in the violence. East African regional leaders held talks in the Kenyan capital Nairobi a day after the leaders of Kenya and Ethiopia met Mr Kiir in South Sudan's capital, Juba. They said they would not accept a violent overthrow of the government in South Sudan and called on the government and rebels to meet for talks within four days. Media captionUNMISS Police Commissioner Fred Yiga: "Our biggest challenge right now is the protection of civilians." Neither President Kiir nor rebel representatives attended the talks in Nairobi but the government in Juba tweeted to say: "We have agreed in principle to a ceasefire to begin immediately, but our forces are prepared to defend themselves if attacked." Presidential spokesman Ateny Wek told regional broadcaster Radio Tamazuj: "It is not a unilateral offer, but it is a conditional offer to be accepted by the other party." In Nairobi, South Sudanese Information Minister Michael Makuei Lueth said the government had agreed to suspend a planned offensive to recapture Bentiu, the capital of oil-producing Unity State. "We are not moving on Bentiu as long as the rebel forces abide by the ceasefire," he was quoted as saying by the Associated Press. In Juba, Mr Kiir reportedly told US envoy Donald Booth he had agreed to release eight out of the 11 detained politicians. Media captionEthiopian Foreign Minister Tedros Adhanom welcomed Mr Kiir's commitment to "an immediate cessation of hostilities"
Speaking to BBC World Service by satellite phone "from the bush", Mr Machar said he was ready for talks but any ceasefire had to be negotiated by delegations from the two sides, with a mechanism agreed to monitor it. Claiming the allegiance of all rebel forces in South Sudan, he called for the release of all 11 detainees. Violence has continued through the week with conflicting reports on Friday about the situation in Malakal, capital of Upper Nile State, where some 12,000 people have been sheltering at a UN base. Both the army and rebels claimed to be in control of the town. Image caption The government is believed to possess scores of tanks like the one seen here in Juba earlier this month. According to Radio Tamazuj, government forces drove rebel soldiers out of the town on Friday, shelling them from tanks. Dozens of houses were destroyed in the fighting, with a tank shell killing a family of four inside one of them, while three dead bodies were found inside another, the radio said. In another state, Jonglei, the aid agency Medecins Sans Frontieres (MSF) treated gunshot victims who had walked for three days from the war-torn town of Bor in search of safe access to healthcare. Image caption Just 29% of children attend primary school in South Sudan - however this is also an improvement on the 16% recorded in 2006. About 32% of primary-age boys attend, while just 25% of girls do. Overall, 64% of children who begin primary school reach the last grade. Image caption Almost 28% of children under the age of five in South Sudan are moderately or severely underweight - this compares with the 33% recorded in 2006. Unity state has the highest proportion of children suffering malnourishment (46%), while Central Equatoria has the lowest (17%).